The ChurchSuite Calendar is a really useful way to to keep all your staff on the same page. Here is how you can add events to the calendar. All events belong to an event Category. What you name your event categories is completely up to you, for instance, events could be categorised as "Children" or "Prayer" or "Christmas" or "Worship Services" - whatever you wish. When you add a new event, you will select the category to assign the event to, or you can add a new category. Later you'll be able to filter and report on event by category, or perhaps just viewing the Calendar for particular categories. To add a new category, navigate to the Categories section of the Calendar module. Click Add category. On the Add category pop-up window, give your category a Name, select a category Colour - all events display on the Calendar in the category's colour - and add an optional Description, perhaps describing the types of events that this category relates to. You can also assign a Brand to the category (see the related support article below) - event pages and event communications will sport the selected brand's logo, emblem and colour styling. The main logo, emblem and colour styling of your ChurchSuite account is selected by default. Finally, click Save for create the new category. If the category for your event is already in place (see above), go to "Calendar" > "Events" and click Add Event. Next, complete all of the event information. The event Name and Category are required. 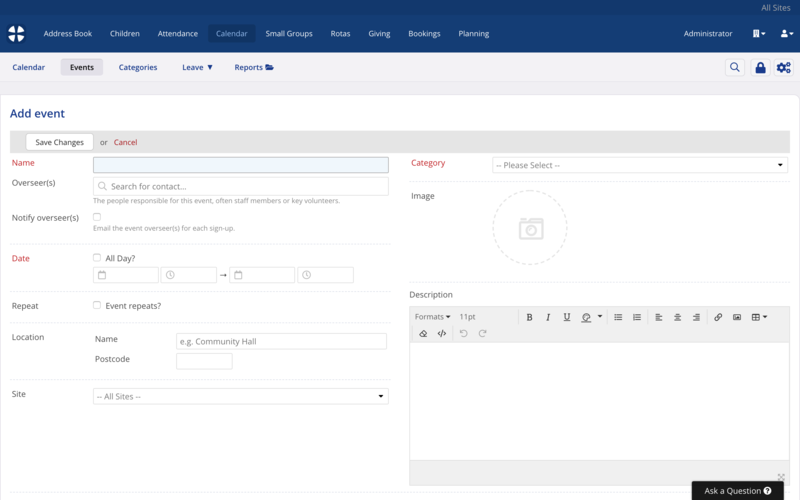 Take time to upload a high quality event Image and write an informative event Description that your audience will see on the event's public-facing event page (if the event is going to be set as visible in embed or visible in My ChurchSuite). Set the event Date and any Repeat pattern. Optionally assign one or more Overseers, who will be able to manage elements of their event in My ChurchSuite and can optionally be Notified when people sign up. The Location fields are used to plot your event on a map - the map shows on the event's public-facing event page. 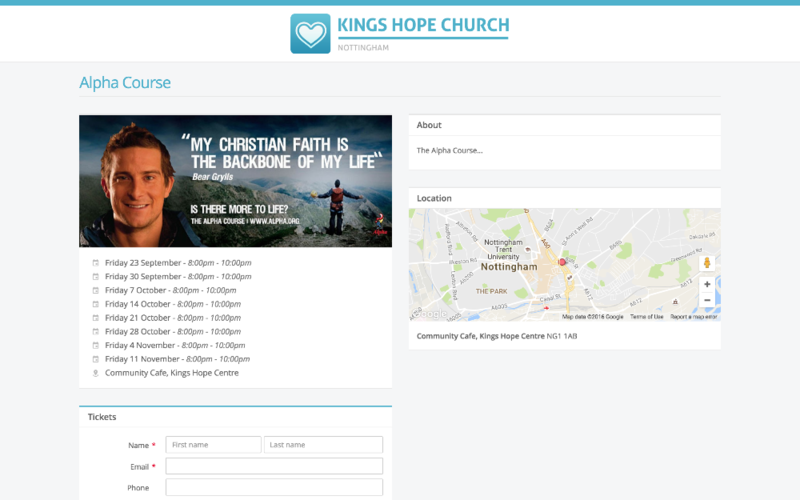 Multi-site churches can select which Site (or All Sites) the event is to be created for. Finally, set the event Visibility to suit your intended audience. Sign Up options, tickets, event questions and confirmations are all covered in our related support articles. Click Save Changes when you are finished, and before navigating away from the page. The new event page is displayed (see example below), summarising the events's site, date(s), time(s), location, category, visibility, overseers and description. Note also the Serving at this time, on the right-hand side of the page, listing all the rotas serving at the same time and for the same site as the event. Where a rota is assigned to a service, we show and link to the Service (rather than each individual rota), otherwise we show and link to the rota - clicking on rota link takes you to a filtered Rotas module's Overview report where you can see who's serving. If the category for your event is already in place (see above), go to "Calendar" > "Calendar" and hover over the day in the calendar that you wish to add the event to (see Thursday 29th in the example below). You will see a green Add event link appear - click it. Following the same instructions given above, enter all the information for your event and click Save Changes. For mobile devices that do not have a track pad, pointer or mouse, it is not possible to add events directly to the Calendar as demonstrated in this section. Instead, use the Add event method described at the start of this article, going to Calendar > Events and clicking "Add event" there. Rather than creating events from scratch, it may be quicker to use a past event, or similar event as a starting place. In "Calendar" > "Events", locate the event you want to duplicate from. Note that you may need to switch from Future events to Past events to locate the event you want to duplicate from. Having located the event, click the cog-wheels on the right-hand side of the event. Select Duplicate. You are now in the Add event page with all the details from the event you were duplicating from, auto-populated in the page. You'll need to update all the details (especially the event date!). Before saving your new event, if the event is to be part of a multi-date sequence, make sure you create the sequence before saving, as this can't be added later. To create a multi-date sequence of events you can either manually Add single date - for example if there's no set repeat frequency (i.e. Ad Hoc dates); or select Add multi-date where there is a fixed repeat frequency. The Add single date and Add multi date options are essentially sequence date generators, so you can use them in combination to build complex, irregular sequences. Note that the event Repeat options are only available when adding a new event - it's not possible to turn existing standalone events into a sequence. Define the range of dates for the multi-date event to run between, and select the repeat Frequency from the drop-down menu. 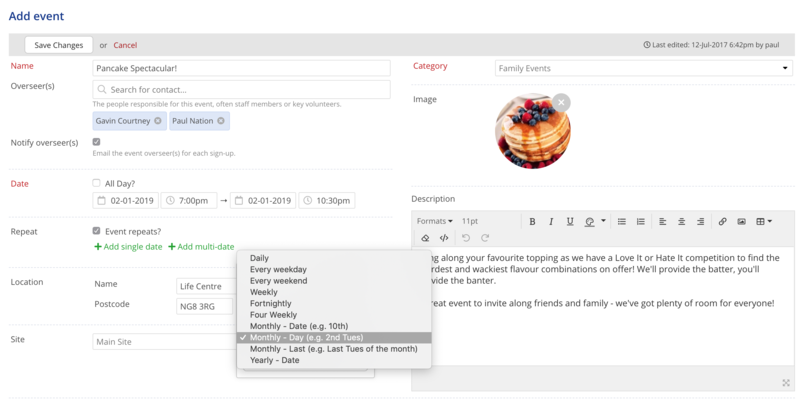 Once your multi-date event has been saved, ChurchSuite will create each occurrence of the event - note the In this sequence summary section on the right hand side of the event page in the Calendar module - visible on any date within the sequence. Multi-date events are retained in a sequence so that subsequent changes to an event in the series can be updated for just that single instance, or across the entire sequence. When editing an event that is part of a sequence of multi-date events, the Update entire sequence? option is displayed. Note: This option will only update the fields listed below the checkbox. To update the event image, see the related support article on updating event sequences. When setting up tickets for a multi-date event, tickets are created against each sign-up date in the sequence. So for events like a monthly newcomer dinner this would be helpful as you would want sign-ups to only be recorded against the particular date the newcomer signed up against. This option is the default option when adding an event - tickets (and event questions, if added) are created for each date in the multi-date sequence. Sign-ups to a date are recorded against each individual date, depending on the date the delegate signs up to. There are times where your multi-date events are all for the same event - perhaps a weekly Alpha course or Discipleship course. In this situation you want your delegates to sign up once against any date in the sequence, but the sign-up relates to all dates in the sequence. To enable this sign-up feature, simply tick the Sign up to the sequence option in the Sign-Up options. Remember, the default setting is sign-up to a date. Note that this option is only displayed if the Event repeats? option is selected - you can't sign up to a sequence if the event isn't part of a sequence! Event repeats? allows you to specify each of the dates in event sequence. Now, when your multi-date sequence event is saved, no matter which date in the sequence you view in the Calendar module, you'll be able to view all the sign-ups for the sequence (see screenshot below). Also, the event's public-facing sign-up page will show all future dates remaining in the series, so your potential sign-ups can easily see that they're signing up to a series, rather than needing to sign up to each individual date. Importantly, the iCal file, attached automatically to the sign-up confirmation email, includes all the future dates in the series when the sign-up clicks Add to calendar from within their email. You can easily add dates to an existing multi-date sequence (although you can't add dates to a single-instance event and turn it into a sequence). From the event view page, select Add to sequence from the action cog in the In this sequence section on the right hand side of the event page. A new event page is opened, pre-populated with much of your event information. Be sure to edit the date to reflect the new date you are adding to the sequence. Save your changes when complete and the extra event date is created and added to the existing sequence. Linked to a booking too? If your event sequence is linked to a booking sequence, the newly added sequence date now needs a linked booking to match. Follow the instructions in the related support article below on linked bookings and events. Essentially you will repeat the above steps in the Bookings module, opening a booking, adding a date to the sequence. It's important, when adding a booking date to the sequence, that you unlink the suggested linked event and relink it to correct event date in the event sequence that you added in the above step. You must do this before saving the added booking so as to avoid mismatched events and bookings. As explained above, event overseers can be assigned when creating an event from the Event "Edit" page; however, it is also possible to manage event overseers from the Event "View" page. When viewing an event, notice the Overseers section at the top of the page, and the option to Add overseer. Whenever a user makes a change to an event or event category, a record is added to the change log for that event or category. To view the change log, scroll down to the very bottom of an event page or category page in the Calendar module and select "Changes" from the "Recent Activity" section. The log includes the change date and time, the user who made the change, and a description of the change. It is also possible to 'undo' certain changes. There's also a useful report in the Calendar module reports called "Added Events". This report allows you to filter a range of dates and see a list of events that were added to the Calendar module within that date range. The report can be filtered by event Category and ordered by date added, event name or event date. The report results include details of each event's visibility and the User that added the event and when. Finally, the "Missing Data" report in the Calendar module that lists all future events with missing data. 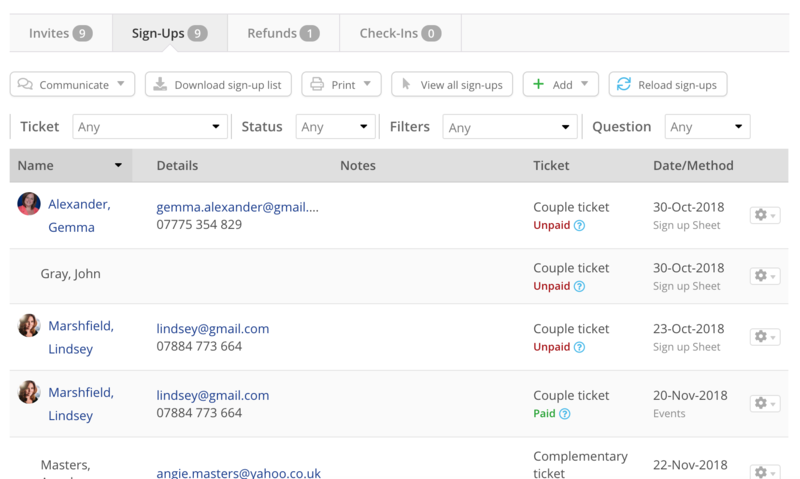 Using this report you can filter to view events with missing descriptions, overseers, locations, tickets, confirmation emails and event images.